The tom looked on in awe as he listened to the she-cat. He had no idea that the forest was so large and that four clans resided in it. He scented the air as they passed over the borders which smelled of urine. He looked around the area and couldn't believe that the white she-cat he walked beside controlled these lands. "Only a moon?" he asked, "What happened to the previous leader and how many members do you in your clan?" he asked with curiosity as they made their way towards the camp. "DarkStar retired and then later died of greencough, as of right now there is no other cats in the clan" Her eyes saddened as she remembered all of the cats that there had been, CrowClan once was a great prosperous clan that no on dared cross, then a sickness fell over the clan. Shrugging her shoulders, she continued to walk, her eyes drifting carefully over the clan territory a sense of pride but sorrow struck at her heart, confusion flooding over her. Snap out of it you bee-brain, GrayStrike and Darkstar would be displeased if they knew you were going to give up. Looking over to you she titled her head, "what was it like living among the two-legs?" Guilt rushed over him as he listened to the She-cat answer his questions. "I'm sorry," he said as he looked on through the territory. His tail still swayed gently as they continues to trek through CrowClan Lands. When the white female asked about his life as a kitty-pet, the question sent anger through his body. His tail whipped out behind him and his ears flicked back against his cranium. "Life as a kitty-pet wasn't for me, I'm sure there are some cat's out there like my parents," he grunted "who enjoy life with two-legs. Their kits were mouse-brained fools who pull on your skin and tug on your tail and whiskers and squeeze you till you can't breathe." he said with a growl beneath his breath. "It's nothing that I would ever recommend to any cat." Jay took in a deep breath as he tried to calm himself. He didn't miss his family and he certainly didn't miss the two-legs or their place. Even though he's only been out in the forest for a few sunrises he enjoyed this life much more than his past one. Her gaze became gentle as she listened to him, feeling his anger she flicked her tail over his back. "You will not have that to deal with anymore, maybe the occasional fox-hearted cat crossing your path, but nothing like you describe." Head butting him playfully, she bounded a few pawsteps a head of him. "Can you hear it?" She grinned suddenly. "The sound of all the birds twittering away, of trees rustling in the breeze... now this.. this is true freedom" Turning to face you she purred loudly. Jay felt her tail flicker over his back which cause him to grow a little embarrassment but all harsh feelings and his embarrassment subsided as he lifted his head and listened to the birds as they tweeted their songs. Excitement swarmed through his body and took over. She was right, this was freedom and he was bound determined to keep his freedom. He darted forward and playfully batted the white she-cat on the head before racing towards a fallen tree. He wasted no time and made a leap to make his way over it but he fell short and his back paws caught log which sent the spotted cat tumbling. The She-cat bubbled with excitement with the sudden burst of playfulness, pouncing around, ducking as he patted her on the head. Eyes widening she purred, but her purr was cut off as she saw the tom go tumbling. Darting over towards him, she leapt onto the log and looked downwards in the direction of the tom. "Jay? a-are you okay?!" she hissed out of worry before leaping down and padding to his side, prodding him on the back she sniffed at him. The tom looked to the sky and chuckled when the female asked if he was okay. "I've never been better." he said with a purr as he watched in amazement. Jay rolled to his paws and came to a stance. He shook the debris from his fur and then looked to the blue eyed she-cat. "How much longer till we get there?" he purred. The tom was relaxed now and he was happy. He didn't know what laid ahead for him but all that mattered right now was that he was getting to be himself and not trying to please his kitty-pet parents. His tail twitched in excitement as he waited for her response. The she-cat felt warmth running through her pelt as she listened to his purr. What in the name of starclan are you doing?!? don't get lost you bee-brain.. Shaking her head she smiled at his words. "actually.. not much longer" lifting her head she looked past the tom. "See that brush over there? that's the entrance to the camp." her tail whisked around behind her as she responded to his question. Her heart began to race as she sensed her home. He looked to where she had directed him and a smiled passed over his muzzle. "Oh," he said a little surprised that they were already there though he was pleased. Jay looked forward to seeing where the clan cats resided though it saddened him knowing that it was just the little white she-cat left from her clan. He wanted to know more of the clans history but he figured it would be best to wait until they got a good rest in. "Lead the way then." he said with a gentle flick of his tail as he waited for the long pelted cat to take him into the clan entrance. "Are you sure your okay?" she stifled back a giggle as she pushed past him and began towards the entrance. She slowed her paced and kept her eyes in the direction of the clan camp, her heart beat quickened.. Was this a sign that the clan would be okay? well.. it wasn't really a clan with just her, in reality.. she was just another loner. Though, being a loner didn't bother the she-cat, it was having the close connections with each cat and then having none and being on your own, lost her own thoughts she found herself stuck in a thorn bush that snapped her out of her thoughts. With a hiss she pulled back, tearing a clump of white fur as she did. Giving the bush a glare she snorted and turned to see if the tom was following. The caramel colored tom followed close behind the white she, "Yes, I'm fine." he said as they made their way towards the entrance. When the she-cat went through the thorn bush and jumped back with a hiss it startled Jay causing him to leap back as well. The male looked to SilenceStar and looked to the clump of fur that stuck to the thorns of the bush. He looked back to her and frowned. "You're bleeding," he said as he moved forward to rasp his tongue gently over the spot where her shortened fur slowly turned a reddish color where the thorns had stuck her. His actions were sudden and very unexpected of him as he gently tried to clean the wound. He had heard of cats who practiced medicine but unfortunately he knew that CrowClan didn't have a medicine cat at the moment so this would have to do unless SilenceStar knew what to do. The words echoed in the she-cat's head, she hadn't noticed or felt anything until he brought it to her attention. The fur around the small wound turned her pelt a redish/pink. Her eyes seemed to gleam in the dim light, they showed shock and surprise as she felt the toms tongue rasp over the wound. Turning her head away, she remained still, her natural reflex would have been to draw away and knock the cat on his head, but his action was soothing and gentle. "E--eh. Th--thank you." She stuttered, pushing the words out. He pulled away realizing his action. He hadn't meant to make the leader uncomfortable. Jays blood boiled in embarrassment as he turned away from her. "Uh.. Sorry." he said, pulling his ears back against his skull. Giving her no time to respond he moved forward, scenting the air for the correct entrance to the camp. He didn't know what to say to the female, now that he had just completely embarrassed himself in front of her. His tail was held low but his ears perked back up as he pushed his way into the entrance on CrowClan Camp. You are acting like a fool! Stop this at once! her thoughts rang loud in her head as she paused in the clearing of the camp, breathing deeply she purred. "Welcome to CrowClan Jay and if it is your wish to stay... Welcome home" She eyed the tom careful as she made her way over to him, brushing off what just happened. Using a paw, she made a small pile of dust before patting it down with a paw. "let me give you the tour, huh?" Shaking her pelt she moved forwards and jabbed with a paw in the direction of a fallen tree "That there is the elders den, it's rather comfortable, nice moss grows inside it." She nodded towards a den that had shrubbery in front of it. "The nursery, next to it is the medicine cats den. Over there" she paused and nodded towards a larger den "is the warriors den and next to it is the apprentice's den... and.." She mewed, eyeing a den that was a little ways away from the other dens "Is the leaders den, thought right now im not sure it matters." she purred. He gave a brief nod to the she-cat but spoke no words when she had said he hadn't need to apologize though he did speak up once he was welcomes to CrowClan and was offered it as a place to live. "Thank you." he said before watching as she showed him which dens were witch. The Elders den, the nursery, med cat den, warriors den, the apprentice den and the leaders den. He repeated the dens as she spoke though a frown passed over his face as he wondered where he was to sleep. He wasn't any of those things. He was a kittypet, a loner. He wasn't any of those things she had listed. He wasn't a clan cat. "Why wouldn't it matter, you still sleep in the leaders den, don't you?" he asked, "You're the leader." he said with a gentle smile. He blinked his eyes and looked out at the dens once more with a sigh. "Where should I sleep?" he mewed to the petite cat. She turned and faced the tom. She smiled before giving a bouncy step towards him. "you would be seen as a warrior, so the warriors den.. But for now, like I said it does not matter which den as of now." Stop showing him sorrow you weak fool! Stop! Why starclan ever accepted you as leader I will never know. The voice in her head echoed the words, weakness wasn't the answer showing sorrow, fear, all of that was weakness and wasn't tolerated. "As for why it doesn't matter to me right now, I cannot bring myself to sleep in the den. I sleep under the stars" She purred and curled her tail over her back. A smile lit up his face as she had said that he would be seen as a warrior. He thought about it for a moment and wondered if he could ever become a warrior, to become a clan cat. He lost his smile as she spoke of not being able to sleep in her den. He didn't know why but he didn't ask either. He felt that he had asked enough questions since meeting her. His tail twitched as he watched her and wondered if she wanted some company tonight or if she'd just prefer to be alone. "Do you want any company? If not I can leave you be." the caramel colored tom with darker colored spots said as he slid into a sit upon his haunches looking to her. She seemed surprised by his question, curling her tail she gazed up at the sky before nodding her head. "if you wish you can join me, I would like the company" her tail tip twitched before she yawed and arched her back, gathering dirt under her paws. The sky above was littered with stars stretching beyond where the eye could see. the moon had already risen and set at it's zenith. Dark gray clouds began to roll in causing the wind to ruffle trees and grass. "One of the best parts about sleeping out in the wilderness... You can hear the forest itself fall asleep, you can almost hear the trees heave a great sigh as they have been working all morning but continue to work through the night helping hold up the silverpelt" She tilted her head and gazed up at the sky. The tom gave a gentle purr as he dipped his head to the leading she-cat. He had been along for a few runrises and having company made Jay feel better about being out on his own and away from his kittypet life. He slowly lowered himself to the terrain and tucked his forepaws beneath his chest. One of his favorite resting positions. He flicked an ear before lifting his head to the silverpelt as he listened to the she-cats words. He dared not to speak as he watched the stars that dotted silverpelt. The night was beautiful which wowed the spotted cat. During the time he was alone and venturing the woods he never once slept out beneath the silverpelt. He had always found shelter to keep himself out of harms way. His tail tip flicked gently as he thought about where life was soon to take him and he couldn't wait. The caramel colored tom glanced the white she-cat before moving into a more comfortable sleeping position. He soon closed his eyes ready for slumber. SilenceStar yawned a large yawn before curling up into a tight ball, casting a final glance over to the tom, she gave a faint smile before shutting her eyes and falling into a deep slumber. -Almost as soon as she had fallen to sleep she was thrown into a dream. She dreamed of a forest, once she was quite familiar with, but also rather confused by. She had been here often since receiving her nine-lives. Sighing she twirled around, looking for the familiar gray pelt, shaking her head she began moving along the ground, her pawsteps making no noise as each paw hit the ground. "If you find it amusing to disturb my sleep GrayStrike you are sorely mistaking." her voice was rather on edge and she leapt onto a boulder and sat down, curling her tail over her paws. "Why don't we stop playing games and talk?.. I found a m--"
"Calm your whiskers SilenceStar for you are nearly done with the quest I've sent you on." The voice of a tom echoed in the clearing in which silencestar sat. "Stop playing games we are not kits Graystrike, come out and talk"
"Okay, okay." the tom called Graystrike purred and came into view, his pelt shimmered faintly, his pelt and eyes glimmered like all starclan warriors. "The tom you found is indeed the one you were searching for.. SilenceStar, your destiny is intertwine with his. Make him you deputy and your clan will rise for sure, ignore starclan's wishes and let all of crowclan fall and crumble away in the wind." "What!?" she hissed leaping to her paws, glaring daggers at the tom below her, "you have got to be joking, he is a pet! one that lived with those disgusting twolegs, he doesn't know ou-"
"SilenceStar, hush yourself.. The tom that has entered your life is strong and willing to learn, teach him our ways and let our bidding be done." At that echo's surrounded the she-cat and like a large paw smacking her in the face she woke up with a jump, the sky above was still dark. Sighing she settled down and watched you. The tom woke up sometime in the night and to his surprise eyes were watching him. He jerked himself backwards and pinned his ears to his head. "Is everything okay?" the spotted tom asked as he looked to the white she-cat. The sky was dark and the moon still shined high. Jay watched her quietly as he waited for a reply in wonder as to why SilenceStar had been watching him and how long she had been watching him. He didn't understand as for why and it made him wonder if the she-cat was regretting bringing him here no matter what the cat in StarClan had told her. "Nothing" she mewed simply, curling into a tighter ball and resting her tail over her nose. What could she say to make him stay? would he stay if she just said, 'would you stay'. Shutting her eyes she tried her hardest to fall back to sleep, but the nagging voice in the back of her head kept her awake. Make him the deputy? when will I have to do this? does he even know how to fight, I've already confirmed he can't hunt.. The tom listened to the she-cat. 'That was a lie.' he said to himself as the white cat said it was nothing. He lowered his gaze as she curled herself into a tighter ball. He was growing uncomfortable, of course she'd lie to him, they barely knew each other so why would she want to tell him what's truly going on. The tom flicked an ear and went to rise to a stance but stopped mid way when the leader asked him an unexpected question. 'Would you join CrowClan?' the words repeated through his head uncontrollably as he tried to figure out what was going on here. Did she really want him to join or was she being forced to make him join. He wasn't sure but he knew he was excited and without giving it another thought he blurted out his answer. "Yes, of course I will. It's what I've wanted for as long as I can remember." the tom said in excitement. Surprise stung the she-cat like a thorn in the paw. 'yes, of course I will. It's what I've wanted for as long as I can remember.' Lifting her head she gave a steady purr, her eyes shinning brightly. "Then I would like to welcome you home Jay. Tomorrow we can start your training and hold a ceremony to give you your warrior name"
The tom gave an amusing purr, he was beyond excited but he couldn't help but wonder why she had suddenly asked him to join and he couldn't help himself as anger flooded over him. He narrowed his eyes slightly and then looked to SilenceStar. "I'm a kittypet.." he said in a hushed tone. "why have you asked me to join?" the caramel colored cat said as he watched the white cat. His anger buzzed inside of him as he thought about being a kitty-pet and about how SilenceStar just welcomed him as part of her clan yet he knew the white she-cat saw him as a kitty-pet no matter what she had said in the past. 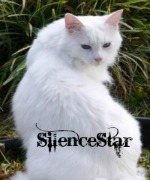 His tail swayed from side to side as he waited for SilenceStar to answer his questions.